Purple and green is my absolute color combination! I like them so much that I updated my blog to reflect that love affair--what do you think? I could share pics of all the purple things I have (especially my bling phone case! 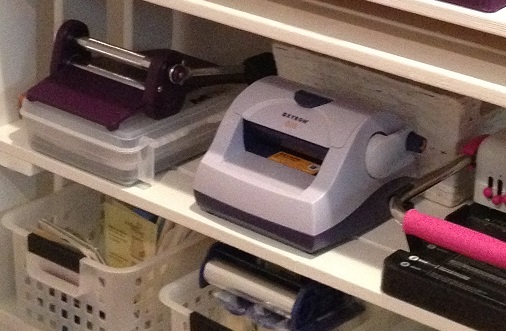 ), but in keeping with the papercrafting theme of my blog, I'll instead share my recent shelf renovation. In fact, I'm redoing my entire studio, but it's a process. This is one area of the studio. I took out some shelving that was inefficient, that's why so much is on the floor! The two unfinished shelves in the back were the focus on this phase of the renovation. 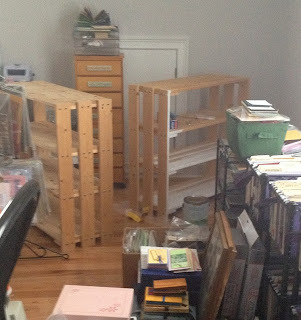 We've had the shelves for years--they used to hold our homeschool books. I've often thought of painting them, and now was definitely the time! All the trim and cabinets in the studio are white, so I opted to paint the shelving white, as well. I had also wondered if stacking them was a good idea. And here is the completed shelving. I love the stacked look. The purple bins were purchased at Lowes.com. I was surprised at the variety of bins styles and colors they had. So glad to find purple ones! I made tags for the bins using manila tags, spraying them with green ink spray. For the labels on the plastic bins, which I've had for many years, I just swiped a green ink pad across the labels. There was also room on the shelf for three of my favorite machines. 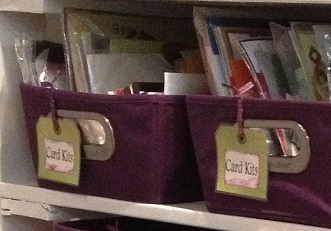 Underneath, I have plastic bins holding the supplies for each machine to keep everything together. And that is the end of phase one of the studio renovation. 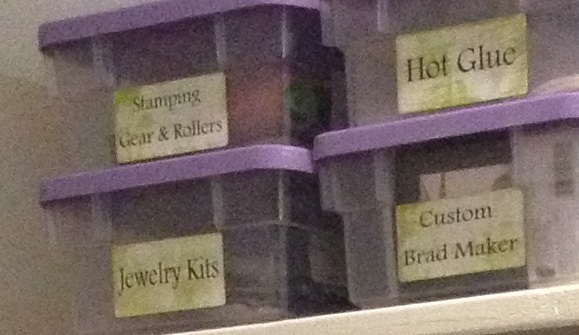 I think I'll tackle the UM stamp storage area next! That is awesome! I really, really, really need you to come help me with mine. It's so much stuff with the stained glass and scrapping that I am overwhelmed. The space can't be larger, so it has to be more organized. HELP!!! Just come down and give me pointers. The bookcases and the blog!